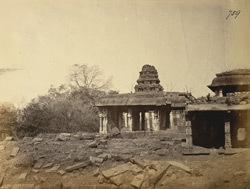 Photograph of the kalyan mandapa of the Narasimha Temple at Ahobilam, Andhra Pradesh, taken by an unknown photographer in c.1870s, from the Archaeological Survey of India Collections. Ahobilam is an important Vaishnava pilgrimage site and the principal place of worship of Narasimha, the lion-man incarnation of Vishnu. There is a one temple complex in lower Ahobilam and another in upper Ahobilam. The temples were built in the late 15th and 16th centuries under the Vijayanagara rulers and consists of nine shrines dedicated to the nine different forms of Narasimha. The mandapa or hall in this view was initiated by the Reddi rulers in the 14th century. The granite piers have clusters of colonnettes with carvings of divinities and rearing animals with riders.